“Ceci N’est Pas Une Drill” starts to get at a topic that could be a really fascinating, compelling kernel for Maniac: the way we use the stability of genre as a coping mechanism. For the most part, genre conventions are consistent, even across stories that seek to subvert those tropes. A mob story includes cases of confused identity and interlocking betrayal; surprise blood ties and magical mirrors often appear in fantasy tales. These are comforting things, occasionally, elements that we can rely on to be present and inviting when we engage with art. That’s part of why the formulaic quality of romantic comedies is often a feature, not a bug. 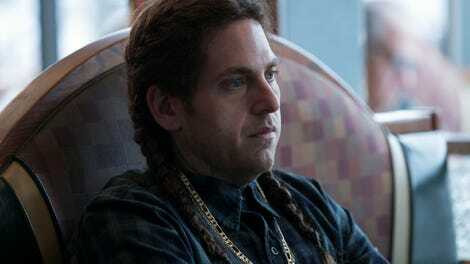 By giving them the mental equivalent of bowling alley bumpers, the drugs in Maniac make it easier for the characters to navigate their own histories and issues. Annie recognizes this quality in the fantasy story that becomes her C pill experience. Here, Annie is Annia, a half-elf ranger escorting the elven princess (Ellie) to a lake with mystical properties, where she can potentially be healed. For a while, Annie’s general cynicism and gruffness fits well into the Aragorn archetype—she drinks a lot, tries to wheedle more diamonds out of Ellie, and seems ambivalent about whether the princess lives or dies. But once she looks into a mystical looking-glass (literally seeing her own “reflection”), Annie realizes what’s happening, and unsuccessfully attempts to convince Ellie that she’s not real. This makes sense—is it really that likely that Annie is the only sane person in this entire world? "Ceci N'est Pas Une Drill"
The Annie story in this episode is much more compelling than Owen’s, partly because high fantasy is a great genre for this kind of exploration. When we learn that Annie is being hunted by “invisible assassins” sent by “Queen Gertrude,” they’re invisible assassins, but they’re also representations of Annie’s... well, her demons. This works because fantasy is inherently figurative in some way, divorced from our ordinary perception of reality. Owen’s story, on the other hand, feels a bit too on-the-nose. Here, he’s Owen again, sort of. Owen’s family has been configured as a literal crime family: his father is a brutal mob boss who commits tons of gruesome murders with a drill. There’s a bit of a Baby Driver vibe here, largely because Olivia is incarnated as a waitress at a diner who might as well constantly be blowing giant bubbles of gum. 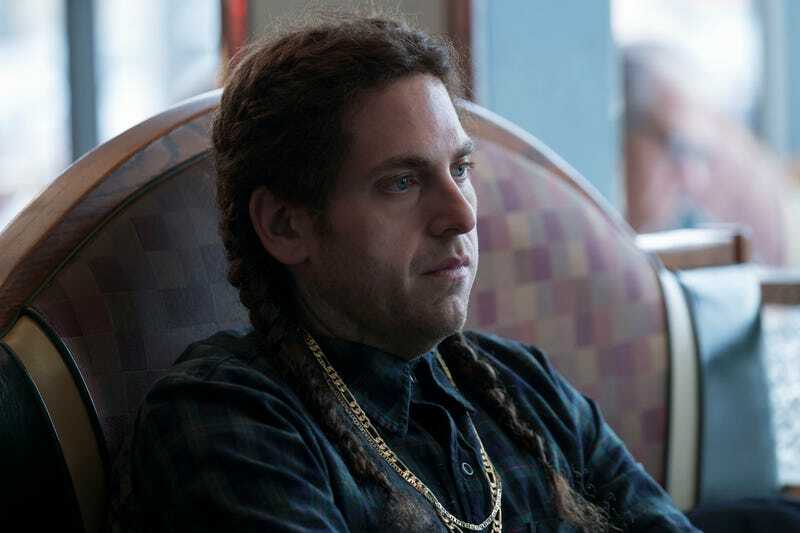 (Oh, also, Owen has tattoos, braids, and just generally speaking looks like Jonah Hill doing a Post Malone impression on Saturday Night Live.) Owen’s dad wants him to take the fall for one of the drill murders, using his son’s mental health problems as an easy way out of criminal liability—a sort of clearer distillation of Owen’s dilemma in whether or not to testify on his brother’s behalf. A few other actors from earlier in the season come back in this part of the episode, too. Besides Byrne, Jemima Kirke shows up, this time as one of the cops handling Owen’s work as an informant. It’s nice to see her—and there’s some funny material here—but this reflection feels a bit like Maniac going through the genre conventions simply because they’re there, rather than because they add anything to the season as a whole. I’m not complaining about Gabriel Byrne yelling “Hippocampus!” while inserting a drill into a dude’s skull, but it does feel a little gratuitous. Thankfully, that’s basically fine, because “Ceci N’est Pas Une Drill” is a very short episode of television, to the point where it’s practically a normal episode of a comedy show—about 22 minutes. A certain breezy quality contributes to my overwhelming read of this episode, which is that it feels like the traditional first half of a two-parter. There’s all setup for whatever the real confrontations end up looking like toward the end of the C pill experience, which doesn’t mean it’s not worth having. Instead, it mostly whets my appetite (and maybe yours) for the ensuing fireworks. Aside from a brief glimpse of Dr. Greta sleeping, we don’t see much of her—or her interactions with GRTA. Instead, James worries about what might be happening, as we get a really beautiful shot of the younger Dr. Mantleray staring through the window of the pod in terror and admiration, like he’s looking at a caged animal. Even though viewers will likely have plowed straight through into the next episode, it still gets the job done: getting us to wonder what comes next. Like Bobby in “Exactly Like You,” the talking dragonfly here appears to be voiced by the actress who plays the Ad Buddy who wanted to go to Salt Lake City with Annie. Also, Ellie’s elven home is called “Riverdale,” which just makes me want Julia Garner to guest star on the best show on TV.